It can take a new subdivision several months to look inviting after it has been occupied. Most new homeowners are focused on getting oriented, arranging utilities, making sure children are settled in school and ensuring their interiors feel like home. As such, landscaping can take a back seat to the other list of priorities, leaving the neighbourhood looking incomplete for a while. In addition, homeowners often don’t know where to start. 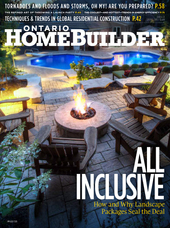 Some home builders see this concern as an opportunity to offer outdoor landscaping packages—packages that offer short-term and long-term benefits for the homeowners, neighbours and builders alike. James Bazely, president of Gregor Homes in Barrie, is one such company distinguishing itself from some of its competition. “We started offering basic front entrances with planter beds about 20 years ago—really basic stuff with plain Holland Stone and 6” x 6” timbers,” says Bazely, whose packages can can range from a simple $3,000 front entrance to a $100,000 complete yard with soft and hard landscaping. The timing of such projects, of course, is critical. Adrian Bartels advises waiting about a year from the date of backfill of the foundation for the soil to settle before moving forward. His company, Cedar Springs Landscape Group in Oakville, which claimed 13 awards at the 2015 Landscape Ontario Awards of Excellence ceremony, has dealt with a handful of builders during its 20 years in business. Gregor Homes, meanwhile, does the landscaping to coincide with homeowners’ occupancy. People enjoy the fact that they can start entertaining their friends and family soon after they move in. The landscaping packages “allow people to move in on Friday and host a BBQ party for their friends on their poolside patio on Saturday,” Bazely says. While builders can bank on the fact that new-home buyers will focus on aesthetics for the front of their home, and entertaining in the back, trends have continued to change, says Bazely, whose early clients chose square, plain walkways, then moved to funky curved paths, and now have even included wheelchair ramps that don’t look like accessible walkways. Just as each family is different, so is each project. Homebuyers can choose from retaining walls, pools, fences, gazebos, ponds, trees and shrubs, among many other options. Included with every Devonleigh purchase is the front walkway, a decorative rock, and a flowerbed of perennials and shrubs with a layer of mulch and a small tree. “It is a finishing detail of every Devonleigh home,” Ponce notes. Devonleigh uses Whispering Pines Landscaping out of Orangeville to prepare the design, supply and install all of its landscaping. That expertise helps avoid a common mistake many homeowners make with their initial lawn and garden work. “Our packages are designed in such a way that different plants are flowering at different times throughout the season, therefore preventing them from looking overgrown and overcrowded,” Ponce explains. Getting such work completed by or through a builder at the time of construction makes sense for homebuyers from multiple perspectives. 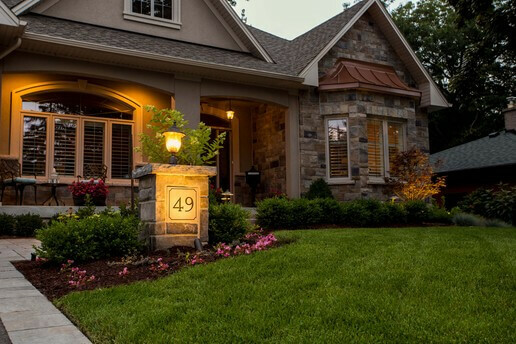 Scheduling is also easier than having homebuyers contract out the job since Gregor Homes Ltd. has its own fully staffed division to handle the project—Outdoor Living Landscapes, which was established in 1997. “We try to advise as to plantings so the plants grow into the landscape as opposed to the plants outgrowing the landscape,” Bazely adds. Having made the largest investment of their lives, new home owners are eagerly anticipating the gleaming new finishing touches on their prized possession. Adding an immaculate landscaping job to the mix not only makes their transition much more seamless, but helps them show off to friends, family and even passers-by that their new home is indeed something special. And that’s a seed worth planting in the minds of prospective buyers.